Postmark can't hardly read any. 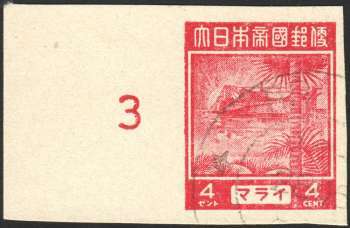 On the left side of the stamp, showing number 3, could be row number. Singapore printings of 2 cents and 4 cents are known with poor quality impressions, as if the plate was worn and the ink was thin. These are known imperforate or with rouletting instead of perforations. It is possible towards the end of the war, with transport between the East Indies and Malaya getting difficult, that the printing plates for the 2 cents and 4 cents were moved from Batavia to Singapore. A single transfer of plates, thereby avoiding the need to send bales of printed stamps. In this scenario, only the 2 cents and 4 cents were printed as in multiples they would cover most postal requirements. Perhaps they were printed at the Singapore printings works, but as no perforating machines were available there, they were rouletted or left imperforate. If this scenario is true, it must have taken place about July or August 1945. Japanese Occupation of Malaya, the Pictorial Issues written by Susan McEwen. Published by Malaya Study Group G.S.M April 2009.